In this day and age where literally hundreds of new startups are launching every month- and most of them being partnership oriented – it is extremely important to have a positive and transparent Business partnership contributing to the success of the startup venture. Business partnerships can be very closely compared to a marriage, if there are constant differences of opinion and failure in understanding other’s point of view, Business partnership is bound to be unsuccessful? 1 Having a mutually agreeable vision and mission. Having a mutually agreeable vision and mission. The very first step for any business should be to define a joint mission and vision that is mutually agreed upon. If all people involved are not working in same directions, they are bound to have problems on the way. Partners need to take out time and discuss what motivates and energizes them and accordingly put it in writing. Personal motives behind each could be different, but overall goal for the business should be same. Business partnerships come to fore for variety of reasons and expectations. Obvious strengths are normally identified and utilized, but in most cases it stops at that. The important aspect is identification of underlying strengths that are often overlooked and not paid attention to. If these underlying strengths are brought out, it can often make a big difference in long term motivation, commitment and success. Each person in the partnership has his own reasons for being in the partnership. Sometimes people seek a partner for capital, sometimes for expertise, sometimes for connections. These are not always expressed, yet in most cases they remain as an underlying expectation. If the expectation is not met, the relationship can easily become strained. Thats why it is important to lay all the expectations before each other before finalizing on Business partnership. This I think is one of the most important reasons why lot of partnership ventures are unsuccessful. As mentioned earlier, strength of each partner needs to be identified and accordingly work areas need to be decided. However, in most cases strength of each partner is not enough to address all areas of venture. They may range from strategy, product/service development, marketing and sales, personnel and operations management, financial management and administrative. In an effort to save money, these lacunas are not addressed as partners neither have expertise nor interest. These things often pile up until they become out of hand and risk sinking the business. Although when partners join forces they often decide who is going to doing what. However, in most cases it is not done in detail and accountability for each area is not defined. Till such time that things are going smooth, it does not seem to be of much importance. However, when things do not go as planned, blame game takes precedence thereby souring the Business partner relationship. The best solution is to come up with a RACI (Responsible, Accountable, Consult and Inform) chart defining roles of each. Every joint venture is bound to have good and bad times. In any type of partnership disagreements are bound to happen. What is important however is to not to let bad feelings build and fester over time. Having regular dialogue and sharing your feelings and finding a way out of disagreements is the best approach. There are lot more things than these 6 tips mentioned above for a partnership venture to be successful. 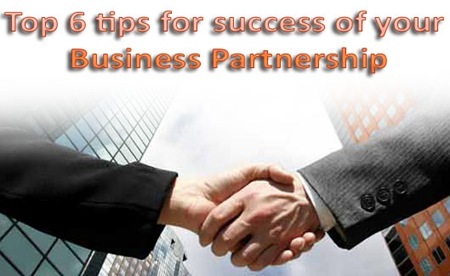 However, if these basic pointers will allow you to build a strong foundation for success of your Business Partnership. India Inc losing its shine? How can we resurrect brand India? Mega Acquisitions by Indian companies changing brand India ! Please elaborate the above points with examples and your sharing personal experiences. This post sounds too bookish!